Skyscript.co.uk :: View topic - Mundane chart for the Kingdom of England? Mundane chart for the Kingdom of England? Posted: Fri Mar 24, 2017 9:29 pm Post subject: Mundane chart for the Kingdom of England? I'm talking about the original one from before the Glorious Revolution and Act of Union. Basically, a kingdom that lasted from roughly the 10th century to around the 17th century. The reason I'm interested is because most historians think England began before 1066, often saying 927, or 1043 at the latest. Depending on whether you view Cnut's empire and the Danelaw as new states supplanting �thelstan's kingdom, or see the House of Wessex as the "legitimate" ruler up until William the Conqueror, who bases his claim to England on being related to Edward the Confessor. But the charts you see online if you look up "mundane chart of England," almost invariably use 1066. Why does there seem to be such a disconnect between historians and astrologers? My understanding is that all of the British monarchs ultimately derive their legitimacy from descent from the House of Wessex. (And therefore, from their descent from Odin.) But putting a date on that is going to be somewhat difficult, especially given the legendary nature of the earliest members of the lineage. The British polity is a hard one to date; there wasn't really a single revolution or event that defined it, and there's always the British habit of completely changing the nature of their government while maintaining the pretense of old forms and denying they're doing anything of the kind. The restoration of Charles II or the Glorious Revolution appear to this outsider to be the launch dates of the current British polity, unless some later act like the passage of universal suffrage is held to be the defining moment. I'm not really sure that we need to go all the way back to the founding of the House of Wessex. I'm thinking more along the lines of when England was politically unified as a country. Some undefined time in 829 by King Egbert of Wessex. 12 July 927 by King �thelstan at Eamont. 11 May 973 when King Edgar was coronated as King of England at Bath. 3 April 1043 when Edward the Confessor was coronated, symbolizing an independent and united England free of Danish influence. 25 December 1066 when William the Conqueror conquered England. My understanding of the history during the period is that England switched hands several times between various Scandinavians and the native dynasties. England was for at least a time a part of Knut's Danish empire. The claims of various Scandinavian dynasties were why Harold Godwinson, Harold Hardrada, and William were all fighting for the throne in 1066. Other much later dates that might be considered are the 1707 Act of Union, which created the UK and gave it the name; or the accession of Edward VII in 1901, beginning the current dynasty. Then again, my understanding is that the monarchs were largely politically irrelevant by 1901. Britain is very hard to figure out because there have been very few instances of people declaring that the old government was scrubbed and we're starting anew. Instead, it seems to me that you have all sorts of named institutions, most of which survived your several conquests and civil wars, but which wielded wildly different powers and did wildly different duties over the course of their nominal existence. The horoscopes use his coronation at Christmas, I believe. I haven't seen any that use the actual invasion itself. I am aware of Cnut's North Sea empire, and one of the justifications for a 1043 chart is that the previous incarnation of England associated with Wessex would have been subsumed into the chart for the North Sea Empire, and ceased to exist as an independent state until Edward the Confessor took the throne. So, I've been doing some testing, and I got an interesting idea. While 1066 may not be the actual chart of England, there's no doubt that it's at least an extremely important transit chart. Whichever earlier chart really is connected to England should show stressful aspects from transiting Mars and Saturn on this date, right? The Norman Conquest wasn't exactly a pleasant event. Note that a lot of these charts are based on coronation times, and I'm assuming they happened at noon, so the ascendants and such have to be taken with a grain of salt. I'm also focusing in on the traditional planets, and considering Pluto/Uranus/Neptune might lead to different conclusions. On the 927 chart, the most interesting aspect is that transiting Saturn is conjunct the South Node. There's also a transiting Sun opposition Venus, but that doesn't seem like severe enough symbolism. There really aren't as many obvious hard aspects as you'd think. In the 973 chart, the transiting Moon opposes Jupiter and squares Saturn. That could mean something, but it's not quite as striking as the next one. On the 1043 chart, it gets more interesting. Transiting Sun applies to a square with the Sun. The Sun also applies to a conjunction with the transiting Ascendant. Transiting Saturn has just separated from a square with the Moon. Transiting Mars is near an exact conjunction with the Descendant. So, in my subjective judgment, if I were to use 1066 as a transit chart to determine the most relevant earlier chart for England, I would have to say it's the 1043 chart. The 1043 chart is unusual in that it gives England an Aries sun, Sagittarius moon, and Leo rising. That really contrasts with the modern image of England, and it's not even the earliest unification of the land by the House of Wessex. But there are hints in history that it could be the correct one. You could argue for any of them, but here are the things that stand out for this one. 1. Leo rising. Weren't Lions prominent in the national symbolism of England at one point? If England has Leo rising, that's now completely logical. 2. Edward the Confessor (upon whom this chart is based) was made the patron saint of England, and it's said that he was very popular among the people. That whenever people were feeling oppressed, they'd talk about wanting his laws brought back. 3. William Lilly, an astrologer who lived in 17th century England, associated his own country with Aries rather than Capricorn. Because he wrote Christian Astrology in 1647, he would likely have been describing the original Kingdom of England, and not anything that emerged later. Well, testing an older chart against such a modern event might not work out. But let's see what happens. Transiting AC near Sun, Mercury, and MC. Transiting Mars opposing Moon, Mars, and Jupiter. Transiting Jupiter near AC. Transiting North Node near AC. Transiting Saturn opposing Saturn. Transiting Jupiter near IC and opposing Sun. Transiting Sun, Transiting Moon, and Transiting Mercury conjunct Sun. Transiting Sun conjunct MC. Transiting Saturn conjunct Moon and North Node. Transiting Mars separating from Mercury. It seems like the 1043 and 927 charts are generating the strongest symbolism for this particular event. The 1043 chart with Leo rising strikes me as consonant with my distant view of things. Leo rising makes sense, given that lions have always been a symbol of England. 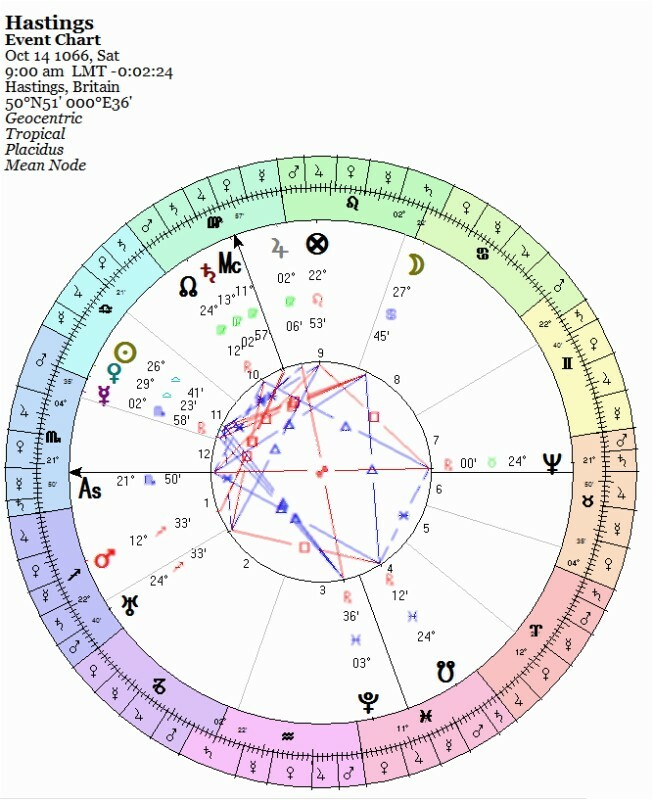 A well dignified Sun in the 10th house trine Jupiter out of the first might be interpreted as showing England leading the world (mostly) by example in its political institutions. In the transits chart, Jupiter opposing the original chart's midheaven, and of course the cusp between the houses of religion and the houses of public life, may be significant. I was thinking that the 1043 chart seemed strongest. Someone showed me this chart on another forum when I asked why some people think England is an Aries country. He claimed that he'd heard a rumor from an astrologer that this date was considered relevant by someone back in the 17th century, but wasn't able to verify it. What's interesting is that using Edward the Confessor answers a lot of the objections of people who insist on the 1066 chart. For instance, people say that if you use any chart earlier than 1066, it doesn't account for the Norman or Danish influence on England. But Edward spent much of his time in exile in Normandy, and had a few Normans in his court. Supposedly, the Normans tried to put him on the throne unsuccessfully in 1034. His mother (Emma of Normandy) is Norman, and also the mother of Harthacnut, the last Danish ruler. His father was the previous Anglo-Saxon king, �thelred the Unready. Harthacnut invited him to England to take over for him, and he had to promise to uphold the laws of Cnut. Edward can be viewed as the first king with Norman heritage, the last Anglo-Saxon king, and the half-brother of the last Danish king. He's actually connected to all three dynasties that wanted to claim England, and therefore arguably accounts for the influence of all three on English culture. The other thing worth noting is that the previous incarnation of England in 927 was absorbed into the North Sea Empire and operated as part of it until Edward took the throne. Arguably the power of Wessex was already broken before Edward took the throne, and his gaining the throne had more to do the other connections he made through his mother. Being the son of �thelred helped give him a stronger claim, but he probably never would have gotten the throne peacefully if his mother hadn't been Harthacnut's mother. He is, in a way, the perfect symbol of the England that arose from the conflict between Danish, Anglo-Saxon, and Norman dynasties, and of the ambition of Emma of Normandy that created the mess. I mean, he's half Anglo-Saxon, half Norman, lived through Viking raids as a child, grew up learning about the Norman court while signing two charters as the King of England in exile, and had to agree to uphold the laws of Cnut before he could take the throne... to me, that seems more than a little symbolic of the new English identity being forged here. William the Conqueror arguably just finished what Emma of Normandy started when she made sure both dynasties fighting over England had heirs with Norman blood. Seriously, talk about not putting all your eggs in one basket. I've been researching William the Conqueror and Harold Godwinson's claims to the throne... honestly, it seems like William has a reasonable claim to the throne. But it's an extremely contentious issue because either or both of them could have been lying. The thing is, I think a 1066 chart seems to be starting from the assumption that William was lying and Harold was telling the truth, making William a usurper. But it's definitely debatable. I've seen knowledgeable historians argue about this for pages and pages. Transiting Mars separating from a conjunction to the North Node, and a few conjunctions with Venus. Transiting Sun is conjunct the South Node, and applying to opposition with moon. Transiting Mercury applying to square with Sun. Transiting Mars squares Mars. Transiting Saturn separating from square with Moon and applying to square with Mars. Transiting Sun separating from opposition with Sun, and applying to square with Moon. Transiting Saturn separating from opposition to Moon, and from conjunction with Saturn and North Node. Transiting Mercury separating from opposition to Sun. The impression I have here is that the 927 chart isn't describing the event very well. The 1043 chart seems adequate to describe the event. And the 1066 also describes the event. The symbolism in both the 1043 chart and the 1066 chart seems very similar. Well, the next one that comes to mind is the Act in Restraint of Appeals. This was the break with Rome that allowed Henry to get a divorce. I had a really hard time finding a date for this. Most sources only say first week of April. But I did find a source that claims 7 April 1533. Transiting Sun separating from square to Sun and Mercury. Transiting Mars applying to square Moon. Transiting Saturn separating from conjunction with Venus. Transiting Sun separating from conjunction with Sun. Transiting Jupiter conjunct Moon and North Node. Transiting Mars square Venus. Transiting Mercury and Venus conjunct Moon. Transiting Jupiter and Saturn square Moon. Transiting Mars opposite Jupiter. I'm having trouble seeing the event in the 927 chart, but both of the others seem to show it in some way. In the 1043 chart, you get a sense that a new expression of religion (Jupiter) is now upon the people and their destiny (moon and North Node). Also, that the King (Sun) has reminded everyone including the Pope of his power as a ruler (Sun conjunct Sun). In the 1066 chart, you see it expressed in another way. Religion (Jupiter) and law (Saturn) have become a problem for the people (Moon). This is an attack (Mars) on religion (Jupiter). It seems like both are valid ways to look at it, depending on how you feel about the Pope and the Catholic Church. I'd suggest that if the Catholic Church was unpopular at this time, then the 1043 chart works better for this event. Otherwise, the 1066 chart works better. Well, the next event that comes to mind after this is the founding of Jamestown in 1607, often considered the beginning of history in American schools unless they decide to mention Roanoke. It should still count as English history at this point, right? Transiting Sun opposite Moon. Transiting Mercury and Venus opposite Saturn. Transiting Saturn opposite Mercury and Venus. Transiting Sun conjunct Venus and opposite Saturn. Transiting Mercury separating from conjunction to Mars. Transiting Venus applying to conjunction with Mars. Transiting Mars applying to conjunction with Mars. Transiting Saturn square Sun. Transiting Jupiter conjunct Moon. Transiting Saturn conjunct Sun and Mercury. The 927 chart is finally showing a lot of conflict and opposition... but I don't see why. This might be the best result yet for 1043. The king (Sun)'s sailors (Mercury) have found (Mercury separating from Mars) what he desired (Sun conjunct Venus). The native warriors (Mars) are peaceful and helpful (Venus) at first. With great difficulty and expense (Saturn squares) and some skirmishes later (Mars square Mars), the fort is established. 1066 still works. The people (Moon) now have more room (Jupiter). The sailors (Mercury) and the King (Sun) will have a rough time (Saturn) establishing this fort, though. The impression I'm getting is that the 1066 chart does work better than most earlier charts, but not better than the 1043 chart. In fact, I think if you were mostly testing the chart to predict the outcome of a war, the 1066 chart is a good one, because it was one of the first major conflicts England had after becoming a separate kingdom again. And it would contain a lot of profound symbolism with William the Conqueror being the first king crowned in Westminster Abbey and the capital being moved to London. On the other hand, Edward was responsible for making the Abbey what it was, and possibly leaving behind coronation regalia for all future coronations. Oliver Cromwell destroyed the regalia when the Commonwealth of England was created, though. Maybe this was never a popular theory, and people really only considered 927 and earlier charts that might represent the first political unification of England as alternatives. I mean, I have to admit that using 1043 would seem odd to some, because I'm admitting the North Sea Empire all but ended the previous kingdom, and that it was restored with Edward, but then turning around and saying that William had a right to the throne, making Harold the usurper and William the second king of modern England rather than the first or the third. I'm probably using a chart that doesn't sit well with people... it's neither the last invasion of England, nor the first political unification. It's just the re-emergence of England as a separate kingdom outside of Danish control. What might be more important than whether William actually had a claim, though (which is always going to be a debate), is whether anyone believed he did. People in those times believed in trial by combat... that if you could win a duel with the person you were accusing, you were telling the truth. If that same rule applied to war, then people may very well have thought God was on William's side, and that he was the rightful king after all. What really matters for the kingdom's identity isn't whether historians believe it now, but whether people believed it back then and for a long time afterwards. Finally, I think another issue is that because the English character is archetypically Capricorn now, people are inclined to believe the English were always Capricorn in the past. Stiff upper lip, practical, disciplined, polite, reserved, not showing emotion, etc... but what if they weren't? What if they used to be very proud, assertive, adventurous, expressive, people? In other words, well... fiery. Then the 1066 chart wouldn't describe their character well at all, with a Pisces moon and a Capricorn sun. I've come to the conclusion that, at least with transits, the 1043 chart seems to work about as well as the 1066 one, if not better. It's just too bad that we don't have a clearer idea of what the English character was like before the Victorian era, because most attempts to describe it were during or after. This is a rather odd result; the Norman Conquest working better for the common folks while the coronation of the last Saxon king expresses the royal/establishment perspective. The Conquest might be interpreted as the founding of the people or the language. May look at some of the other event charts and see if this holds true. My understanding is that English manners in, say, the Restoration era were substantially different; and in aristocratic circles at least things did not change all that much under the Hanoverians. George IV did a great deal to shape Victoria's sense of public propriety. The Methodist and other religious revivals in the late eighteenth and nineteenth centuries were another part of the problem, as was, later, the temperance movement. Out of curiosity, I set up the Battle of Hastings. One interesting thing about the battle is that we can know exactly when it started, at 9 in the morning, and that it lasted until dusk. This chart does not appear to describe any nation of the British Isles, but it describes a battle whose outcome is very much in doubt. The first thing you notice is that Mars, lord of the Scorpio ascendant, squares the Midheaven. Yeah, we get it, there's a war on. The odder business involves Venus, sitting pretty in Libra in the eleventh, but at odds with an also strong Moon in her home base out of the eighth. On the other hand, Venus is under the Sun, but the Moon carries the Sun's light to Venus. And a collision with retrograde Mercury is inevitable; worse, the start of this conjunction will be a short sharp shock because of Mercury's early and Venus's late degrees. Yeah, that's an interesting chart. I never really studied the Battle of Hastings itself as much as the outcome and the things leading up to it. It is primarily a 17th century and earlier English character that I'm trying to establish. I know all about the Victorian Era character. What's interesting is that I've heard conflicting reports about how people in England felt about the Church. I think even some of the common people resented sending money to Rome. I'm starting to wonder if perhaps they represent alternate perspectives on the country in general rather than specific social classes. I mean, think about it... there were probably people that believed William or thought God was on his side, and those who lamented the death of Harold and saw William as a usurper. The reason both charts could work is because they both represent different perspectives on the English character and on various political debates. Different views on the legitimacy of William/Harold, different views on the break with Rome, etc. It seems that even to this day, people from the modern UK can't agree on the character of their nation. For instance, I've seen people advocate for a 1927 chart for the UK... which gives the same Sun and Venus as the 1043 chart, with a Sagittarius rising and a Leo moon. But my point is, if people disagree now about 1801 vs. 1927, then there might also be a debate between the 1066 and 1043 perspective. The difference is, since the 10th century was so long ago, people just deferred to historians that had one perspective rather than the other without seriously trying to challenge them.